Tamiya RC Subaru Impreza STi WRC 99 - TT02(RC Jaz Hobby). Tamiya RC Subaru Impreza WRC 99. Tamiya has faithfully reproduced this sleek racing machine in 1/10 scale on the TT-02 entry level touring car chassis. The TT-02 chassis platform is the successor to the TT-01 as it incorporates many new features to make it even easier for the new R/C kit builder to assemble and learn from. The TT-02 chassis performs well as cornering and overall speed has been enhanced to take advantage of new electronics available on the market. In addition to the TT-02 being an ideal platform to start from, R/C hobbyists can expand its potential by adding many of the Ho-Up-Options available to increase the cars speed and performance. Scale: 1/10 - Construction type: Assembly kit - Terrain use: On-Road - Drive-train: 4WD - Drive type: Gearbox - Drive line: Dog bone - Differential type: Gear - Suspension: Fully independent double wishbone - Steering mechanism: Bell-crank - Shock damper: Friction damper - Shock damper material: Plastic - Tire type: Rubber - Tire tread: Rally Block - Body material: Polycarbonate (Unpainted Body) - Chassis material: Plastic - Electronic Speed Control (ESC): Included - LED Light buckets: No - LED lights: No - Motor: 540-brushed type - Bearings: Plastic bushing - Special feature 1: Length: 442mm. Special feature 2: The classic form of the car is recreated in polycarbonate, with separately-molded side mirror and rear wing parts. Special feature 4: Stickers are included to recreate the markings on the car, as are window masking stickers for use when painting. Special feature 5: 16-spoke gold color molded wheels are paired with rally block tires (Item 50476). Special feature 6: A wide range of option parts is available to tune the TT-02 chassis. Special feature 7: Includes a Tamiya TBLE-02S ESC and Torque Tuned motor. Requires A: 2-channel radio gear - Requires B: 7.2 battery & charger - Requires C: Polycarbonate paint. 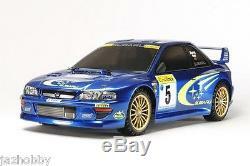 The item "Tamiya 58631 1/10 EP RC Car TT02 Chassis Subaru Impreza STi WRC 99 GC8 withESC" is in sale since Monday, May 23, 2016. This item is in the category "Toys & Hobbies\Radio Control & Control Line\RC Model Vehicles & Kits\Cars, Trucks & Motorcycles". The seller is "jazhobby" and is located in Hong Kong. This item can be shipped worldwide.